I Love Harry Potter badge. 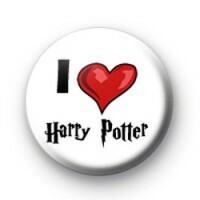 If you are a big fan of Harry Potter this is the perfect button badge for you. A classic white badge with I Love Harry Potter written across it. Ideal for all of you who dream of attending Hogwarts school of magic. Standard 25mm harry potter badge.